A new iPhone is being announced in a few weeks. No doubt it will be better than ever. Rumors say it will cost close to $1000. Sounds like a lot of money? But consider how much your iPhone does. And now consider just the function of video recording as it existed in 1984. This Montgomery-Ward catalog entry makes it clear how far we’ve come. (Click the photos to zoom and read the copy). In 1984 you needed enough equipment to make you look like a news reporter wannabe – a bulky color camera cabled to a portable video cassette recorder that hung from your shoulders. A thousand bucks for the camera – even more for the VCR. Granted, the VCR was pretty snazzy since it was made up of a “portable” component which docked into a base station. 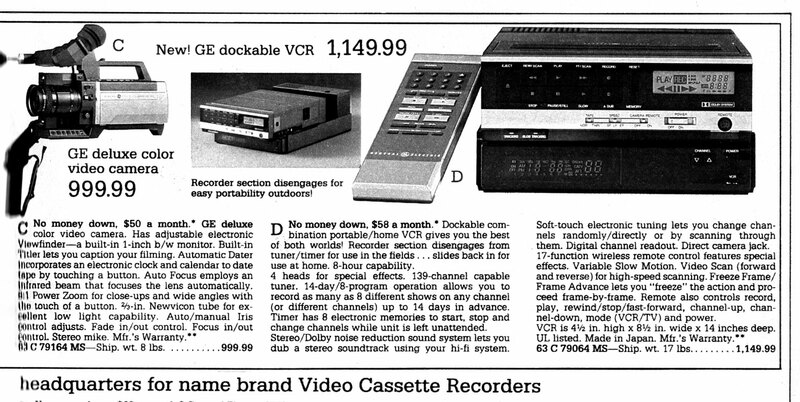 But even this top-of-the-line consumer gear only recorded onto conspicuously low resolution VHS tapes. Forget about HD. Forget about slow-mo. Forget about editing. Mainly what $2150 bought you in 1984 was the envy of your neighbors as you taped your kids’ birthday parties… but that was worth something. 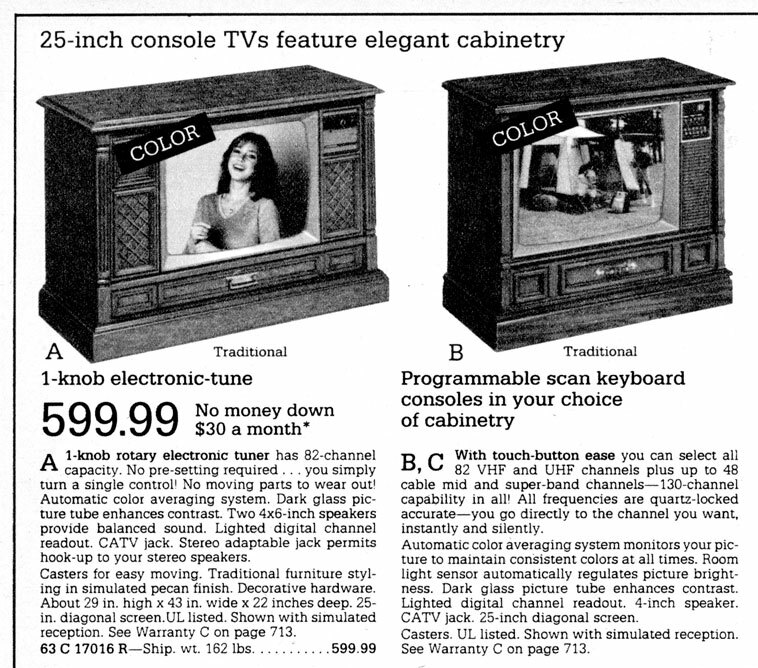 Of course, the only way to see it was on your 1-knob rotary electronic-tuning 25″ home TV set (another $600). In 1984 we were a long way from Youtube, Vimeo, instant messaging, Snapchat, Periscope, Facebook, or any other way to share it. These days, even at $1000, everyone whips out their phone at the slightest opportunity to shoot what strikes their fancy. Don’t know if anyone’s watching, but — whew — at least we got it recorded!